The New York-based plastic surgeon is on a mission to meet her patients wherever they are. VIOLET GREY profiles female beauty entrepreneurs who are considered industry game changers because of their individual approach to business. Each one entered the conversation in her own manner and maintained a steady, if not unparalleled, trajectory with her indomitable spirit. 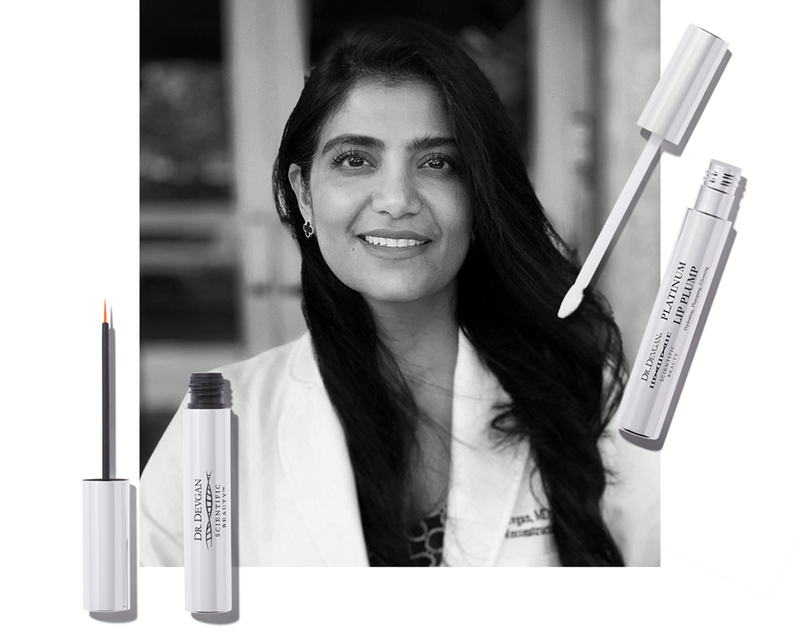 Here, we talk to Dr. Devgan founder Dr. Lara Devgan. If you want to get something done, ask Dr. Lara Devgan, who might be one of the busiest women in the beauty industry. The board-certified, Yale-educated, Johns Hopkins Medical School-instructed, and Columbia New York Presbyterian Hospital-trained plastic and reconstructive surgeon simultaneously runs her practice, Scientific Beauty skin care line, and Beauty Bosses podcast, she is also a mother of six (ages nine months to seven years!). My bedroom is functional chic with a side of six young kids. When we go to bed at night it's more on the chic end of the spectrum where it's beautiful and serene. Then as the night progresses more children, more milk bottles, and more stuffed animals come into our room, so it gets more functional by the morning. We have a big bed with a beautifully lit headboard that also serves as a space for our favorite novels or cell phones. I like our bed because it's a place where our whole family can snuggle and gather in the morning. We keep our most important things on the headboard like fancy earrings, a cell phone, chocolate milk, or a stuffed animal. My kids wake up very early so probably around 5:30 a.m. I think training to be a surgeon and going through a surgical residency at Columbia really beats the concept of a normal sleep cycle out of you. I can get by on just about anything. Still, I think it's important to be healthy and try to get about seven hours a night. . I have a cup of coffee that my husband makes for me every morning, and that's one of the cute little things that he's always done for me. Every morning when I drink my coffee, I think about how lucky that one little thing has not changed despite all of the other things that have. Only if you count chasing my kids around. I wash my face with my Platinum Revitalizing Cleanser. Then, I use my Platinum Hyaluronic Serum. If I had a desert island product, it would be that because it absorbs a thousand times its weight in water and gives you this dewy makeup-free perfect glow. I also use my Neck’s Best Thing, which is a neck product, and apply a little bit of that on the back of my hands too. What makeup products do you use on a daily basis? I always use my Platinum SPF 45 BB Daily Tinted BB Cream, which will give you titanium-based sun protection. We made it with a proprietary pigment that is designed to adapt to any skin tone from extremely pale to extremely dark. I like to look at the New York Times on my cell phone, and then when I come into the office, I read my debriefing for the day. I see my first patient at 9:00 a.m., so I try to get here a little before that. By 10:00 a.m. I have probably sent 30 emails, seen five patients, gotten six kids bathed and dressed, and taken four kids to school. I’ve met with every member of my office and probably handled some catastrophe.